When it comes to luxury travel, it takes a lot to impress me. That, after all, is what inspired me to start Villazzo in the first place: I wanted to create a luxury villa rental company that offered exclusive world travelers the finest luxury villas in the world’s top vacation destinations, complete with five-star luxury hotel service. This is what my VillaHotel Concept is all about. Through my travels, I’ve been able to ascertain what I believe to be the world’s top luxury resorts, and they are the destinations that Villazzo currently focuses on: Miami Beach, Aspen, Saint-Tropez, and Capri. To be sure, there are other destinations that could be added to our selection (and maybe will someday), but currently these specific destinations are the ones that have a sufficient crop of luxury villas that meet Villazzo’s strict standards. The next step is always to find the most exquisite, private, luxury villas in these destinations that can then be transformed into VillaHotels. In a place like Saint-Tropez, that’s harder than you think: there are hundreds of houses in and around Saint-Tropez whose owners would like to think are considered “luxury villas.” But in order to determine if a house is truly deserving of the VillaHotel treatment, my team and I have to personally search and inspect the entire villa market in every destination. Most of the villas we see fail to impress. But I recently came upon a new luxury villa in Saint-Tropez that might be the finest I’ve ever come across in Saint-Tropez! I was impressed with VillaHotel Nathalie even before I reaches its gates. I know the layout and landscape of Saint-Tropez like the back of my hand, and just driving out to its location told me that this property was going to be incredibly private, exclusive, and perfectly positioned for one of the most breathtaking views around. Pulling into the driveway, my assumptions were proved correct: VillaHotel Nathalie is located on the private peninsula of Les Parcs, and its sprawling 53,000 sq ft (4,920 m²) of property, private helicopter pad, gated perimeter, and north-facing view of the sea told me that this would be the luxury villa for Saint-Tropez’s elite travelers. A view from VillaHotel Nathalie's entrance. Traversing the property, I was impressed by how VillaHotel Nathalie balances its size and contemporary characteristics with tasteful charm and elegance. It is a one-floor luxury villa, like many in the region, and combines an expansive vanishing-edge pool, sunny patios, and clean, modern lines with a terra-cotta roof and stucco façades that gives a inviting, traditional look to an otherwise formidable luxury villa, worthy of royalty. Inside, VillaHotel Nathalie continued to captivate me. Walking in the sunny entry, I saw to my left a great-room-styled living area, and to my right a large, private terrace (more on that later). Off of these two large living and lounging areas was a stunning dining room, five comfortable bedrooms with en suite, spa-inspired bathroom amenities, office, and a gourmet kitchen, all with spectacular view of the sea. Immediately I felt the ease and comfort of being in a luxury villa with over 4,840 sq ft (450 m²) of living space. But while some villa owners might be tempted to fill such large living spaces with minimalist contemporary decor, VillaHotel Nathalie features a decor and furniture that, like its exterior, enriches the mind and the body, balancing modern aesthetics with familiar colors and textures. VillaHotel Nathalie's unique inner terrace. But most impressive of all turned out to be VillaHotel Nathalie‘s unique terrace. Anyone who vacations to Saint-Tropez knows that the summers are all about being outside and enjoying the incredibly warm, sunny climate. While many luxury villas in Saint-Tropez make use of outdoor living and dining areas, VillaHotel Nathalie features a kind of interior terrace that lets guests experience the sun and the view while still being enwrapped in the beauty of the villa itself. The terrace features an impressive modern sofa array and full-length dining table, large enough to seat a party of guests. The terrace’s capacious french doors open directly into the living room, which is turn features a second set of parallel french doors. When both sets of doors are open, one can lounge on this inner terrace and perfectly experience the salt air and view from the comfort of the villa. 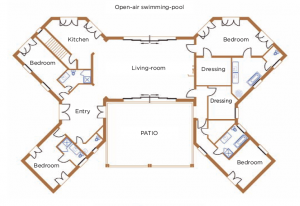 It is truly one of the most innovative floor plans I’ve come across in Saint-Tropez. As I’ve said, it is always a challenge to find luxury villas that are worthy of the VillaHotel treatment. But choosing Nathalie as a VillaHotel was an easy choice. One look at the property, its floor plan, and decor told me that Nathalie had the makings of being the finest, most exclusive luxury villa we’ve ever offered to our customers in Saint-Tropez. This has proven to be true. If you’re looking for the top luxury villa in all of Saint-Tropez, you don’t have to look any further. As a luxury traveler for many years now, I can you that VillaHotel Nathalie is the most impressive villa I’ve seen in Saint-Tropez since 2010. Interested in booking VillaHotel Nathalie this summer? Don’t delay — many weeks have already been booked! Contact us today for more information. This entry was posted on Friday, March 11th, 2011 at 12:13 pm	and is filed under Saint-Tropez, Saint-Tropez Luxury Travel. You can follow any responses to this entry through the RSS 2.0 feed. You can leave a response, or trackback from your own site.